I don’t know if it’s still possible to obtain such bread. The loaves sold in bakeries nowadays do not taste as good as the ones I remember from my childhood. I understand and admire people who don’t buy bread anymore, but decide to bake it themselves. 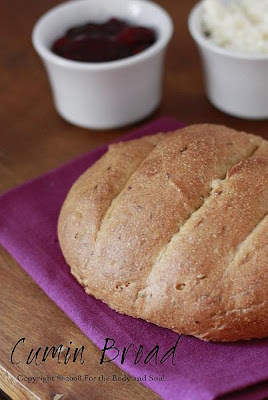 I’ve never really had enough courage to try to make my own loaf before, and I guess I still wouldn’t have the courage, if not Margot from Kuchnia Alicji food blog. 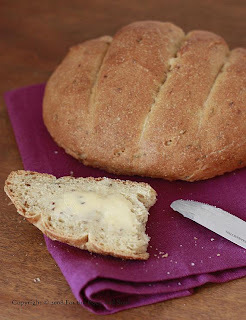 Margot has started a weekly food blog event in which food bloggers bake bread with a recipe chosen by the host of the event. Each weekend the recipe is different. The Cumin Bread which she has chosen from Zorra 's blog this weekend , looked so delicious that I couldn’t resist and decided to bake it too. This is the first real loaf of bread I've ever baked. And, even though it’s far from being perfect, I wouldn’t exchange it for any store-bought bread. 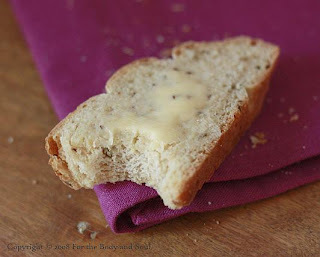 It’s been ages since I had such a delicious fresh and aromatic bread, crusty outside and very soft inside. I would only skip the cumin or replace it with another spice next time (caraway seeds, perhaps), as both me and my husband are not big fans of the spice. The original recipe for the bread can be found on Zorra's blog here. Zorra made her bread using fresh yeast, which is the kind of yeast I usually use in Poland. I didn’t manage to find such yeast in Canada, so I used active dry yeast instead and it worked fine too. Place all the ingredients in a bowl and mix until smooth with a spoon. Cover with a plastic wrap or dish towel and leave at room temperature for 2 hours. Refrigerate overnight. Bring the cream to a boil. Heat over low heat until the fat separates, and the milk solids turn into nutty brown crumbs. Leave to cool. 1. Dissolve the yeast in 50 ml water. Mix the rest of the water with preferment. 2. Place all the ingredients except salt in a stand mixer bowl. Stir with a hook on the lowest speed. 3. Add salt and mix for six minutes on speed 2. The final dough should be smooth and a bit sticky. 4. Cover with plastic wrap or dishtowel and let rise for 30 minutes. 5. Transfer the dough onto a flat surface, stretch and fold (the exact Strech & Fold instruction can be found on Zorra’s blog here). Cover and set aside for another 30 minutes. 6. Shape the dough into one big or two small loaves. Transfer to a baking sheet lined with parchment paper. Let rise for 45 minutes. 7. In the meantime preheat the oven to 420°F (220°C). 8. Just before baking, spray or brush the loaves with some water and slash with a sharp razor. 9. Transfer to the preheated oven. Bake for 15 minutes, open the oven door to release the steam, bake for 20 minutes more. If the bread turns too dark, cover with aluminum foil. 10. Transfer to a wire rack to cool.